Here is The Child Car Seat Accessories list that can help you keep your child safe and comfy as well as make your travel times fuss-free. Having an overall protection for your child will never be possible with just a car seat’s canopy. Except probably if you get the Chicco Keyfit Magic, which provides an almost full coverage. 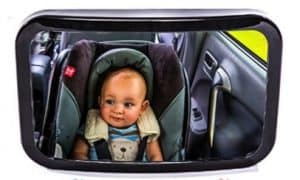 But that is not the case for most infant seats that only comes with canopies that still leave your child open from direct sunlight, the wind, rain, snow, and even bugs. Important note: Don’t use a third party car seat cover while the infant seat is attached to the car seat base inside the car, as it can affect how safely attached your car seat is to the car. Easily checking on your rear-facing passenger is possible by getting this no-installation/no shake, baby safe mirror. While any other backseat mirror can also do the job, this particular brand will give you a lifetime satisfaction guarantee. That means that you can, at any time, ask for your money back, should you not be satisfied with its performance. 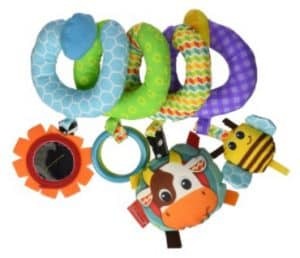 Delight and keep your little passenger busy by hanging toys on the car seat handle. It’s good for improving their motor skills and visual tracking. You can also use it on cribs and strollers. 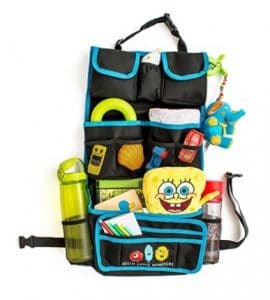 Get a backseat car organizer that can keep your child’s toys, diapers, drinks, and snacks. Long rides will surely need you to keep your child ever entertained. And as they grow a little older, they can get “bored” with the usual hanging toys. Stack it up with toys and snacks and other things you will be needing. Give your toddler their own activity “table” with this travel tray. Your child will have everything they need within their reach (it has pockets, too!) while you focus on the road. Get a car sun shade to keep your child comfortable and free from harmful UV rays especially when driving on very hot days! Strolling on hot days can still be comfortable for your child if you clip on a fan in their infant car seats. A lot of bladeless, rechargeable fans are available nowadays and you can also clip them in their strollers. Parents who need to air travel with a convertible car seat will come to appreciate a car seat travel cart. 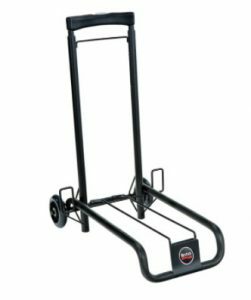 Britax Travel Cart, for example, can help you carry a heavy convertible car seat. Not just specifically Britax seats, but also car seats from different brands. 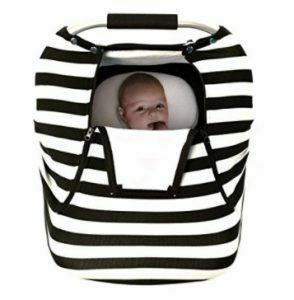 Brica Car Seat Transporter will also help you do the same job, and even let your child ride on the car seat while you pull the seat around. There are times when a car seat travel cart is not compatible with a toddler seat that you have. Having a Car Seat Travel Accessory will allow your to attach your convertible seat to your carry-on suitcase and start rolling away. A car seat adapter would let you customize your own travel system. Some parents are very particular with the infant car seat and the stroller that they want. If they come from different brands, a car seat adapter would let your stroller accept the infant car seat to create your ideal travel system. 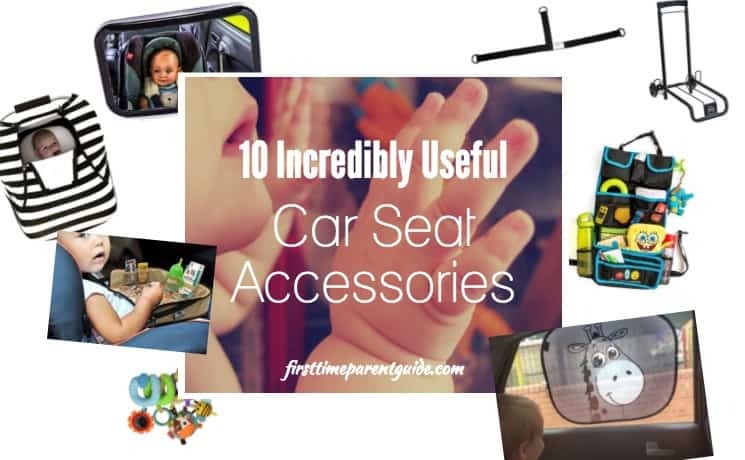 Which Of The Child Car Seat Accessories Do You Think Is The Most Useful? Which of them are you gonna include in your baby registry list? If you have the Noggle, actually you don’t need a fan in your car even in the hot summer. 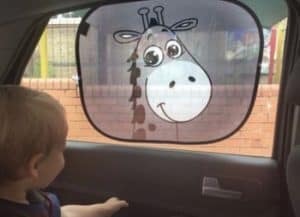 Nice list of car accessories for kids. I didn’t even know some of these are available in the market. You can also include a car seat gate check bag on your list, that will be neat. That’s a good addition. 🙂 Thanks for your input! I and my husband are planning to take the kids to the mountain and enjoy nature for a change. However, the nearest camping ground is a good ten miles away, and I’m sure my kids won’t be able to wait that long. That was why I thought it was amazing that I came across this article and found out about the children’s travel tray. I didn’t know that it is an activity table where they have everything that they need. Thanks for sharing this. I think I’ll go buy a few for my kids. Hi, I have bought a back seat car organizer because this car accessory is ingeniously designed to provide both convenience and functionality. Thanks for this informative post! I think so, too. 🙂 Thanks for dropping by my site. I love this list the most. I have a 3-year-old daughter and I always finding creative ways to keep her entertained and the toddler tray, seem like such a great fit. My daughter likes to snack, read, play, you name it while we’re driving, even if it’s only 5 minutes away, she has to have at least a little toy. Number 4 is another great product! Our car seems like it can never stay organized or clean and this just might make it a little easier. One thing I notice is no electronic recommendations. Let’s face it, we’re all modern mothers and use technology. Any reasons why you didn’t recommend an attachable tablet to watch cartoons from time to time when on long trips? During our times when we were younger, any activity using the eyes can, not only cause us motion sickness but also, possibly ruin the eyesight. Even reading. My daughter once used my phone to watch youtube while the car was moving, and she threw up all throughout the duration of the trip. I do respect parents for whatever they decide to let their kids do, but I believe that the gadget holder is not something I would put inside a car, ergo, it’s not on the list. Hi, Good list of accessories needed for a baby, especially a mirror. I tried to use one, but unfortunately, it didn’t work at all. It didn’t make enough contact with the glass. But yeah, when having a 2-year-old kid that can make any mess. The car sun shades are the best, I will change mine to something with a drawing. Thanks so much for sharing your thoughts. 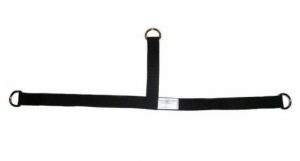 🙂 There are back seat mirrors that you can easily attach to most head restraints with an adjustable strap such as this Britax Back Seat Mirror. Love it, I haven’t seen that mirror attached to the seat before. 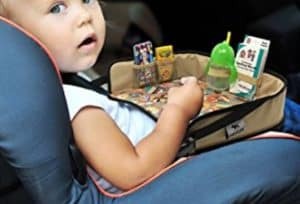 I think I would buy the back seat car organizer and the toddler car seat travel tray. Good and practical choices. 🙂 I feel that having the back seat organizer will eliminate some weight in the diaper bag. Often, people who don’t utilize the use of the backseat organizer ends up with an overpacked bag that usually ends up in a mess at the end of the day, LOL. First-time parents often tend to overpack, and with an organizer in the back seat, some stuff can go there instead.